Some of eBay's biggest discounts are available from sellers in China. While these sellers usually offer the lowest price, there are drawbacks. Be careful when buying from China as there are special circumstances that may arise when dealing with their sellers. One of the deciding factors for many buyers is the shipping and handling time. 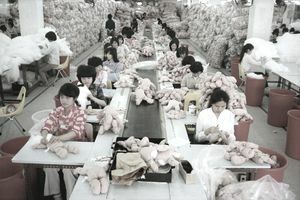 Many sellers in China and other foreign countries advise of shipping times measured in weeks (4-6 weeks is common), rather than days, which is not an exaggerated expectation. It can take 6 weeks for an item to arrive in the USA from China. Unfortunately, there have been many instances of counterfeit, fake, or knock-off goods sold on eBay, particularly from China. Exercise caution when purchasing high-dollar items, such as luxury purses, new iPhones, etc. from China. Counterfeit items are not allowed on eBay; however, eBay is unable to police the millions of listings as they should or would like to. A safe rule of thumb is to assume that a well-known or high-end designer or brand offered from a seller in China is not authentic. If you order an item from China, receive it, and discover it is a fake, always report it to eBay's Vero Program. Just as with any other seller, foreign or domestic, always look at the sellers' feedback. Do they have negative reviews for the item matching the description? Do they ship the item securely? Is there anything unfavorable in their feedback? How long have they been a seller? Make sure the seller has built a successful history of providing good customer service, shipping on time, and delivering a quality product. Do your due diligence before buying from any seller, especially one from China. Returning an item to China is going to be expensive. If you are ordering clothing, shoes, or accessories that might not fit, it is going to be a huge hassle to return them. Also be careful ordering electronic accessories as they may not work properly with your device. For example, you may order an iPhone charger that turns out to be generic and incompatible with your device. Returning may not be cost-effective or possible. "Consider the safety issue: a scary one, indeed, because China has a very well-deserved reputation for producing inferior and often dangerous products. Such products are as diverse as lead-filled toys, sulfurous drywall, pet food spiked with melamine and heparin tainted with oversulfated chondroitin sulfate." Furthermore, there may be a language barrier when asking questions or reaching out to a Chinese seller after the sale. Also, their standards in customer service may vary sharply from what we expect within the United States.